What? I'm updating on a Saturday?? Yeah, I know. This is my late one...the one that should have been up last Sunday. It will also be here as an apology for the fact that I don't have this week's ready yet. So look for it midweek or for a double update next weekend. I have been really busy and haven't had the time to write an update. So much has happened in my real life that my anime life has taken a side seat. Well...on with the update. Hey guys…so first I want to talk about something NON anime related. Yep, I am gonna mention a thing I have been obsessed with. “Defying Gravity” by Idina Menzel (yep that song from a little play called Wicked). It was only $0.69 on iTunes!?!? Was I gonna pass it up? Nope. On a serious note, can I just take a moment to thank you all? I just one day decided to start to write out my thoughts about anime and manga. Really what I wanted was just a place where I could vent when I don’t have people in my life that I can just talk to. So yes, thank you very much you guys for reading weekly with my updates. I appreciate it, so much. Also I mean I started this blog December 7th of 2013 and it is now (when I am writing this) February 10th of 2014 and you guys have made this blog hit 200 views. 200 VIEWS!!! Can you believe that? Sure that doesn’t seem like a lot but hey I would be this excited if I was getting 1 view per update. But really, you guys make it worth my while to do this. So thank you. A question I have for you that may sound obnoxious is: do you guys like my Podcast-YouTube video...thing? Please be honest because I really want to have it be sort of similar to this but I don't know shorter...probably. I don't know. I think it is just one of those things where you are doing something new and you just need to hash out the rough details to make it perfect for you. Now on with the stuff you came here for. 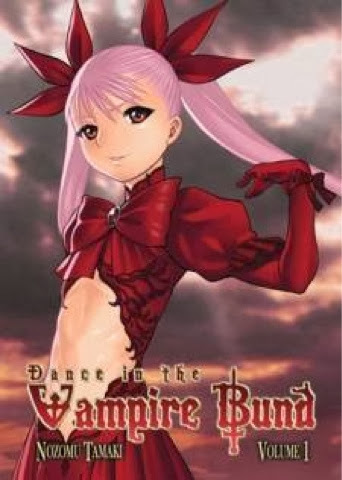 Let's talk about Dance in the Vampire Bund. (Bet you didn't see that one coming). If you follow me on Instagram you should have seen my post about Terri Doty and Dance in the Vampire Bund. I have read the manga and seen the ENTIRE anime (by that I mean I even saw the bonus episode that recapped the whole season). Here is what I am going to be discussing: characters, artwork, storyline, music, and Anime v. Manga. First up is the characters. I think that this is one of my favorite stories purely for the character development. Each character has their own story and each character has growth through the story. I won't go into all the characters because there are a lot of characters, but I will cover a few of the main characters. Akira - so this guy is the lead male. He is a teenage werewolf born to the head of the Beowulf's and is the Princess' personal guard (and love interest too). Now this is where the story is iffy between the manga and the anime. The anime opens with Akira not knowing a damn thing, plus there isn't much talk about any other family than his father (who he doesn't know). In the manga, Akira knows bits and pieces but is just not close with his father rather than not knowing him. (There is a reason for their lack of close bonding which I will get to in a bit). Now in the anime when Akira and Mina meet for the first time he doesn't remember who she is, but in the manga he knows who she is and is already serving her despite the loss of a few memories. (I think they over do it in the anime about his memory loss but whatever...creative choices are left to whoever is in charge). The only issue I truly have with Akira's growth in the anime is that it is too fast and they leave out important details. In the manga Akira's turning point for his beginning of his growth is the fight with Mina but that is NOT the part where he actually begins to grow as a character. It is actually later in the manga when he is fighting for the Princess and he is faced with an old comrade. Also there is some more growth when his little brother is brought into the story (yeah if you haven't read the manga you probably didn't know about his mother and brother). Yes there is always doubt within his mind in regards to Princess Mina but he is still loyal to here. Of course his loyalty falls prey to the fake Mina but he is suspicious of the fake one because of his feelings for the real one. (If that makes sense). Unfortunately that is really where his character development ends because of the ending of Part One of the series. Mina - she is the main character and one of the only characters I have seen that goes through such a drastic change. It is partly thanks to Akira but mostly it is thanks to her best friend Yuki who seems to be the smartest character in the series. (I will discuss that when I talk about Yuki). Now Mina is introduced differently in both the manga and the anime. In the manga she is pretending to be a little girl and hands Akira a rose while Vera pretends to be her. Akira knows instantly who the Princess is because of when he met her before. In the anime however, she is in attendance of the TV show where they are discussing the existence of vampires. She says that she is a little girl from Romania but when the vampire murderer who has been on the loose is revealed she exposes herself as the ruler of the vampires. Mina has always held a heavy wall around her heart to protect herself because she was forced to the throne at such a young age and she is always hounded by the others to marry and carry on her legacy. This is part of the reason (speculatively) for her child-like body despite being hundreds of years old. Her true form is what we assume is her real body but she protects her innocence with a child's body. Because of her child body it comes to no surprise that she acts immature and like a spoiled royal from time to time particularly around Akira who gives into a lot of her whims. When she is around Yuki she acts very much like a love-struck teenage girl who can gossip with her best friend. This is truly where she starts to grow and is coming more to terms with the fact that she is in love with Akira. The moment that you notice this change is when Yuki and Mina are alone in Mina's office at the school and they are talking about Yuki's story. Mina then goes on to showing compassion for her close friends (who are mainly Yuki, Akira, and her maids - especially Vera). Now Mina also starts to draw back into herself especially when she is forced to go on the run. However it is just temporary and she is able to openly express herself as ruler once again. Yuki - she is probably the only character who doesn't necessarily change but invokes change. She was there for Akira despite having been turned down by him (in the anime they even dated in the past). She helps Princess Mina become a normal girl instead of the ruler of monsters all the time. In the anime she is the narrator. The best part of Yuki is that she isn't easily fooled by deception. So when the fake Mina takes over, Yuki is the first one to figure it out. Unfortunately a lot of the times her feelings for Mina and Akira are exploited and make her a weakness to the two. Vera - she is the most mysterious character. She is the cold assistant of the princess and has a dark past. She is really close with Akira and Wolfgang but she is also the most trusted servant of the princess. Often times Vera is paired with Akira when it comes to doing things for Mina. She begins to grow as a character when she reveals some of her past. She also at times stands in for Mina. Next is the artwork. Oh my LORD. The beautiful artwork of Dance is unbelievable. The manga artwork is a little rough, but the anime artwork is so beautiful. I think it is the eyes though. Such beautiful eyes. (How many times do you think I could say beautiful?) Haha, I just don't know how else to explain it. They did a wonderful job. See? Now the storyline. There are HUGE variances between the manga and the anime. The anime starts out differently because they start with a TV show that is discussing the existence of vampires. The manga begins with Akira and Mina. I actually wished the anime had been longer and for being a TV-MA anime they had to cut out quite a bit. For example they barely scrape on the surface of the "other" Mina. Also Mei Ren, as great a character as she is was in fact just an anime only character. The third opponent was actually an old comrade of Akira's bringing about a more emotional second arc. Also the back story about Vera is left out making her just seem like a fan service servant of the princess. So much was left out and I think they could have done better. Oh well you do what you have to. Now I want to start something new. I will call it Character of the Week. I will post clues hinting to who I will choose but when I post the blog on Sunday I will give the full choice. 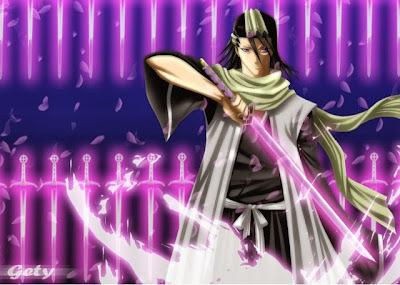 This week: Byakuya Kuchiki from Bleach. My reason: if you are up to date on the manga you know why I have said this but for those who aren't. Let's just say that he is a badass and he makes himself look good while doing it. 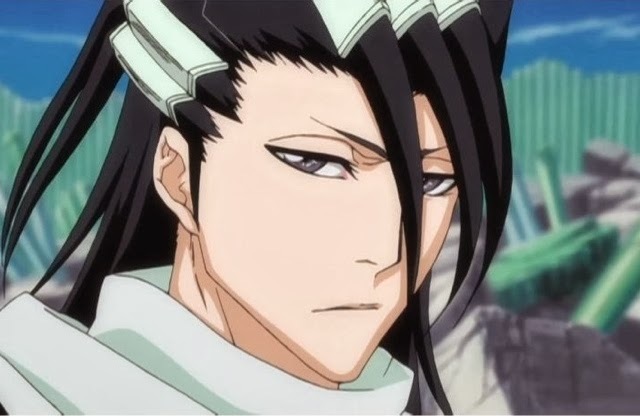 So three cheers for Byakuya, captain of squad 6. A new anime I have gotten into recently is Phi Brain. So far I have only seen one episode but it seems like a good series. It is a three season show so far and the third season is currently airing. Speaking of currently airing shows. Have you guys seen A Pilot's Love Song? If you haven't you should. Totally good. A romance-drama with a bit of comedy. It's really good. Crunchyroll is simulcasting it every Monday. So I haven't done one of these in a while. How would you guys like an anime review?? Let me know in the comments below or on Twitter what kind of anime you would like to see. Or tag me on Instagram in a picture of an anime you'd like me to review. See you guys next week. Don't forget to catch Blue Exorcist's English Dub Television premiere tonight! I'm off to drink some sake now.